The Decision Support System for Agrotechnology Transfer (DSSAT) is a software application program that comprises crop simulation models for over 42 crops (as of Version 4.7) as well as tools to facilitate effective use of the models. The tools include database management programs for soil, weather, crop management and experimental data, utilities and application programs. The crop simulation models simulate growth, development and yield as a function of the soil-plant-atmosphere dynamics. DSSAT and its crop simulation models have been used for a wide range of applications at different spatial and temporal scales. This includes on-farm and precision management, regional assessments of the impact of climate variability and climate change, gene-based modeling and breeding selection, water use, greenhouse gas emissions, and long-term sustainability through the soil organic carbon and nitrogen balances. DSSAT has been in used by more than 14,000 researchers, educators, consultants, extension agents, growers, and policy and decision makers in over 150 countries worldwide. The crop models require daily weather data, soil surface and profile information, and detailed crop management as input. 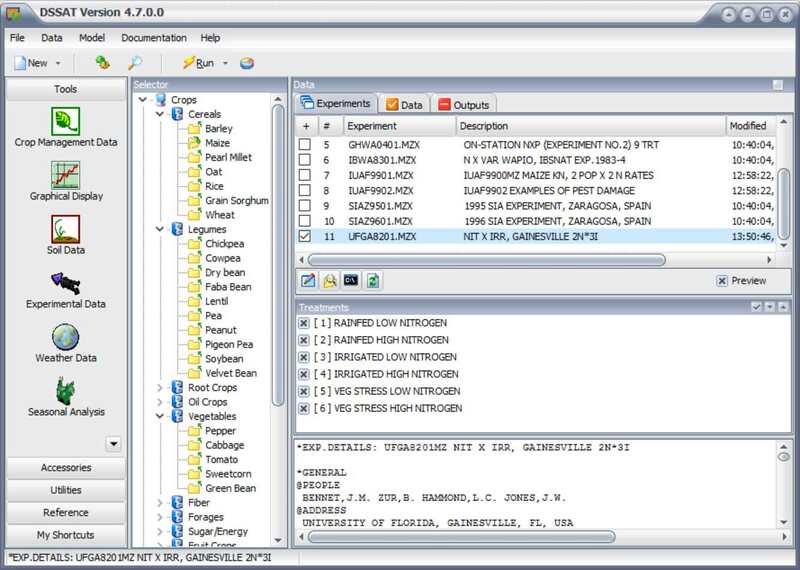 Crop genetic information is defined in a crop species file that is provided by DSSAT and cultivar or variety information that should be provided by the user. Simulations are initiated either at planting or prior to planting through the simulation of a bare fallow period. These simulations are conducted at a daily step or in some cases, at an hourly time step depending on the process and the crop model. At the end of each day, the plant and soil water, nitrogen, phosphorus, and carbon balances are updated, as well as the crop’s vegetative and reproductive development stage. For applications, DSSAT combines crop, soil, and weather data bases with crop models and application programs to simulate multi-year outcomes of crop management strategies. DSSAT integrates the effects of soil, crop phenotype, weather and management options, and allows users to ask “what if” questions by conducting virtual simulation experiments on a desktop computer in minutes which would consume a significant part of an agronomist’s career if conducted as real experiments. DSSAT also provides for evaluation of crop model outputs with experimental data, thus allowing users to compare simulated outcomes with observed results. This is critical prior to any application of a crop model, especially if real-world decisions or recommendations are based on modeled results. Crop model evaluation is accomplished by inputting the user’s minimum data, running the model, and comparing outputs with observed data. By simulating probable outcomes of crop management strategies, DSSAT offers users information with which to rapidly appraise new crops, products, and practices for adoption. 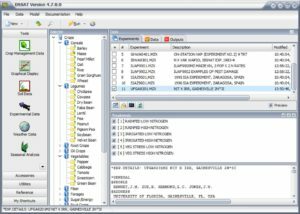 With the release of DSSAT v4.7, many changes have been incorporated — from both the structure of the crop models and the interface to the models and associated analysis and utility programs. The DSSAT package provides models of 42 crops with new tools that facilitate the creation and management of experimental, soil, and weather data files. DSSAT v4.7 also includes improved application programs for seasonal, spatial, sequence and crop rotation analyses that assess the economic risks and environmental impacts associated with irrigation, fertilizer and nutrient management, climate variability, climate change, soil carbon sequestration, and precision management. Following presentation was made at the 2011 American Society of Agronomy Meeting in San Antonio, Texas, by Dr. Gerrit Hoogenboom – at a special oral symposium “Honoring James Jones: Agroclimatology and Agronomic Modeling“.